Mostly the old stuff has been cleared away and replaced by low-rise apartment blocks. Maybe they're an improvement. 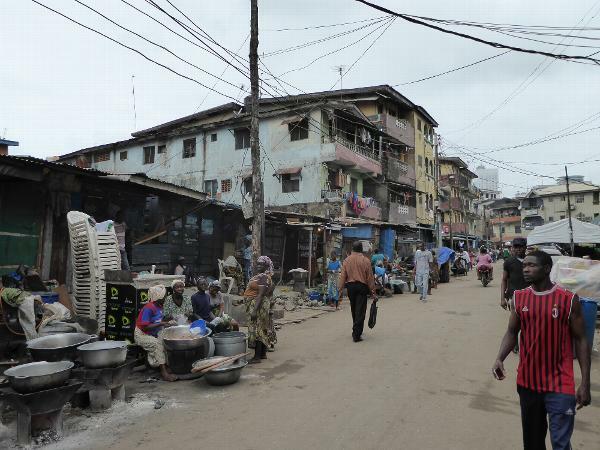 The peripatetic John Gunther visited in the early 1950s and wrote that Lagos had "the worst slum we ran into in all Africa, except in Johannesburg. In the very middle of the town, 28,000 people live on 60 acres.... the houses are so ramshackle that a visitor can walk through them from street to street; each, open at the ends, is so grotesquely dilapidated that it can serve as a passageway." See Gunther's Inside Africa, p. 755.